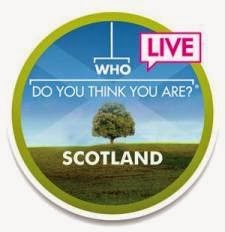 It may still be more than two months off yet, but if you want to pick up a couple of bargain tickets to WDYTYA? Live in Scotland, make a note of this coupon code: LNL2424. To take advantage of this discount, go to the Buy Tickets page, choose the day you plan to attend and then enter the code. You'll see the price for two Adults drop to £12 each. The show will be held from Friday 29 August to Sunday 31 August at the SECC in Glasgow. An extensive workshop programme has been organised, so be sure to check out all that's on offer while you're on the site, and start to plan your visit.